The process of applying for a hospital medicine fellowship will probably leave you facing multiple problems that we are willing to help you overcome. We are aware of the fact that a brilliant doctor will not necessarily be an outstanding writer. For this purpose, we have employed several writers with the relevant medical background to lead you through your application writing process. They are well-versed when it comes to the application procedure and its requirements and will help with writing a fellowship application personal statement that will display you as the outstanding medical person that you are. 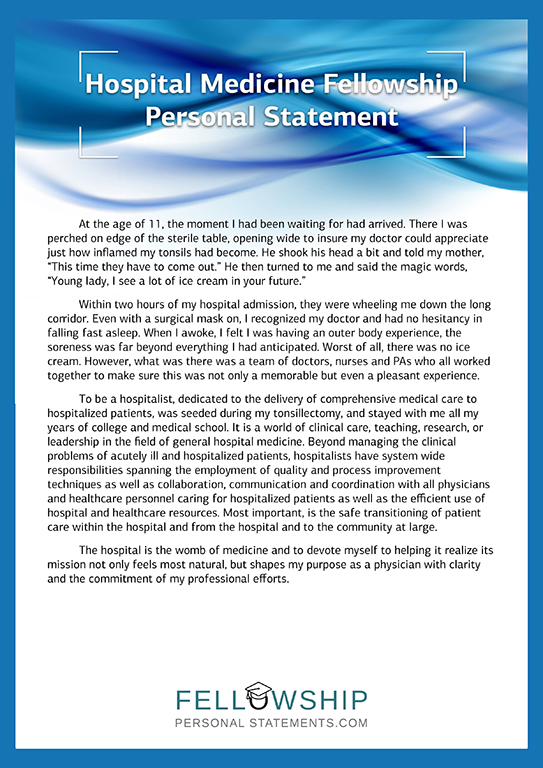 Why Is the Personal Statement for Hospital Medicine Fellowship so Important? Your personal statement is one of the main parts of your fellowship application that will secure your fellowship, and can be the main reason that can get you the desired invitation to a personal interview with the submission committee. By displaying to them who you are and what your goals in life are, you can gain valuable points with the board which in turn will secure an interview. Observe your content – make certain that the words are precise and clear to the reader. Do not use additional adjectives or adverbs to create volume. Never submit your first draft – a first draft is never the final version. Read it, edit it and then proofread it to eliminate all errors. Should you have tried composing your own fellowship personal statement and despaired, then contact us for our help with writing a personal statement. “I have always had a tendency to research about health and how doctors and medicine in general, contribute towards our well-being. It started in school where Biology became my favorite subject followed by general science and chemistry. I always reached very high scores in all my examinations but was first in my class when it came to these three subjects. At the end of high school, I was already knowledgeable about the human body and most of its parts and systems. Attending college filled in the gaps and gave me a general outlook for my future profession. Most of my classmates from college decided to become specialized according to organs, disease or age patterns; I chose to refrain from doing so myself. My objective is to join the ranks of hospital medicine because of the various work patterns it offers. Being able to work in hospital medicine will enable me to work in various areas instead of just one. I am certain that the mixture of acute patient care, research, teaching and executive leadership will be a perfect blend that fulfills all requirements I look for in a professional career. After you have placed your order, our writer that is experienced in writing as well as in your specific medical field will contact you. Please answer all his relevant questions that are asked, this will help him gather all the information that he requires writing your personal statement for a hospital medicine fellowship or neurology fellowship personal statement. He will then also research the specific requirement for the medical institution that you are applying to for ascertaining that all points are being observed. Ask for help with writing a personal statement using our website today!